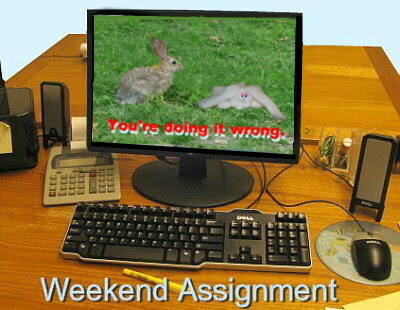 Please note: I am extending the deadline on this Assignment for one week, to Wednesday night April 27th. This is to give people (including me!) more time to come up with an entry despite a busy holiday week (Holy Week and Passover). 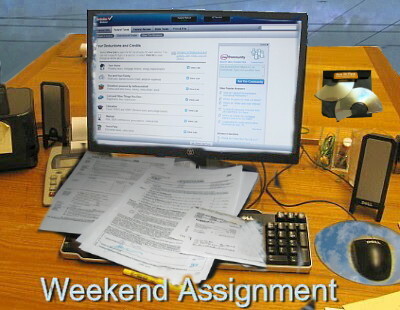 We will resume our usual schedule with Weekend Assignment #367 on April 28th.--KFB. You have until next Wednesday night to answer this question in your blog or in the comments below. If you do participate, please leave a comment here with your name and the URL of your entry. Don't forget to link back to here in the entry itself. That's all there is to it! Please play this week if you can. It's not nearly as much fun without you! Even though I'm an accountant, and furthermore rely on my favorite tax preparation software, income tax preparation still intimidates me, almost every year. This year I was worried about the amended tax forms I got from First Magnus Liquidation Trust, and about the 40 boxes of donations to St. Michael's to sell at the English Faire, the dregs of which I hadn't finished cataloging after many hours of work on it. Plus I recently started working full time again, and had less time for chores at home. So I'd put it off until the very end of March, or possibly the first of April. Once upon a time (read as: up until this year), I pulled my paperwork together as soon as humanly possible and loaded up the Turbo Tax. The faster one files, the faster one receives the refund. Assuming that one is entitled to a refund. I always found it fun - Turbo Tax is good stuff. While I am not the most organized person in the world, I can generally keep my tax information in one place. This year, for the first time, I used an accountant. My finances became a bit more complicated and I figured it was time. Thanks to Josie of josiespeaksup for submitting a topic idea last week on the "Be a Guest Professor page. I'll get to your suggestion soon. If you have an idea for an Assignment, please let me know! I've been working on my taxes all night. How about you? I have enjoyed streaming video from Academic Earth and from hulu.com. But it is sort of like books. There are things I borrow and things that I buy. I still buy DVDs (though not nearly as many as in the past). I still have a half-full DVR of things I am not watching. I haven't tried Netflix yet because I don't want to add another monthly expense. When it comes to entertainment content, I'm still relatively traditional (as defined by "tradition" of the last decade, anyway). 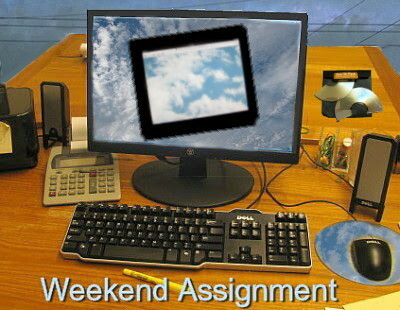 In other respects, I have embraced "cloud computing." I've used Google Docs for years as my main writing space, just because it allows me to access my documents anywhere. A good chunk of my life lives on Google's clouds, actually - my e-mail, many of my photos, my blog; I will be in BIG trouble if they ever crash! This year's big tech buzzword is "clouds." Are you ready to fly? Both Mr Rufai Garba, a manager for the Bank of Africa in Ouagadougou, and Dr Frank Lemon, also of the Bank of Africa, want me to act as next of kin for people I don’t know. Furthermore, the lovely Mrs Daisy Mercy and her late husband, who made a lot of money mining gold, would also like to leave me a large sum of money. There was one time, at Noodles and Company, when I handed over my Visa to pay for lunch and it was declined. I called Chase to rip someone's head off and found that two hours earlier, someone tried to use my card to download music in Brazil. Had I tried to use my card to download music in Brazil? Last week, a guy with a heavy Asian (India/Pakistan or something) accent call the land line here, claiming that "Your computer has a virus." Which computer? Mine? John's? The iPad? I didn't ask him that, though. "Go to your computer and let me show you," he said. Yeah, right. Thanks also to Anne for some great ideas for future assignments. Have a great week, everyone! "What kind of disaster would have to occur for there to be no Internet in Chicago, Columbus or Washington, DC? (the latter cities being the alternate work sites under discussion)"
"A nuclear event," was the answer. We are so unprepared for emergencies that I feel a little guilty as I admit to you the Awful Truth: our entire stash of emergency supplies consists of two cinnamon and nutmeg votive candles and two partially used boxes of matches. I was going to say that at least we have duct tape, but John corrected me. What we actually have is several rolls of clear plastic tape, suitable for mailing packages. 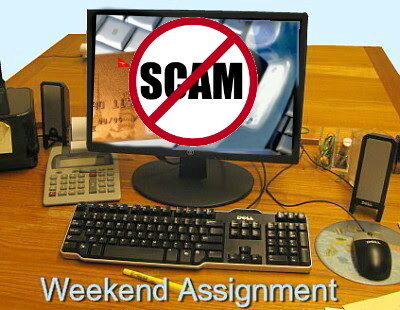 Please do the Assignment this week if you get a chance - and watch out for scammers! 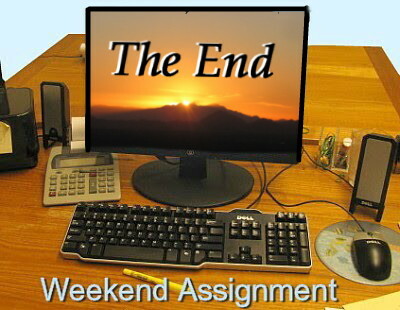 Due to the paid work I've been doing all night (webmastering and newsletter editing), I'm unable to post the new Weekend Assignment tonight. Fear not, however: it will be posted on Friday evening this week, and will return to its usual Thursday night scheduling next week. Thanks for your patience. Back in the day, I gave up French Fries every year for Lent. It was a good one for me because it was something that I enjoyed enough to make it a sacrifice, but not such a deprivation that I was twitching two weeks in - like those people that give up caffeine. I considered it participating in a tradition that many of my friends and colleagues valued, and it was good for my health. One year, I gave up playing Mahjong on the computer for Lent. It was one of the games on a Disney Mulan software package, and I'd become quite addicted. Giving it up cold turkey was a really good thing to do. Did it bring me closer to God? I'm not sure, but I certainly don't regret my choice that year. There are also some fascinating and varied responses on beliefnet. Have a look! 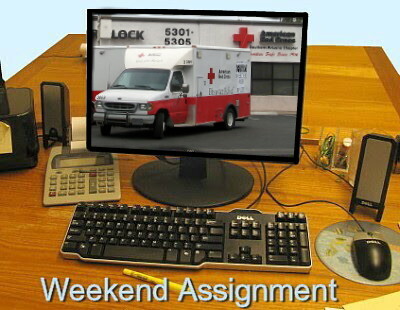 Please do the Assignment this week if you get a chance - and stay safe!